Product Consist: Bunch of 12 Mixed flowers Like Roses, Gerberas, Carnation, Gladiolus with lots of filler and Matching Ribbon Bow Tied, Teddy Bear (6 inch) along with 1/2 Eggless Dark Round Shape Chocolate cake. 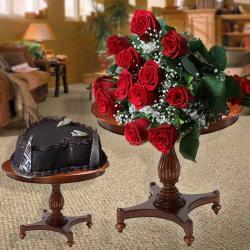 The beauty and sweet smell of the flowers and cake will surely enthrall your loved ones. 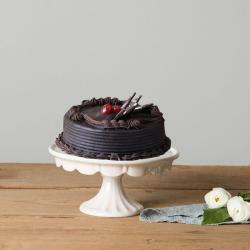 This hamper also includes a delicious black forest cake with bouquet will surely convey the message to your loved ones. Here is a gift combo which is just perfect for gifting the one you love. The combo consists of a bunch of flowers and a cake. The bunch of flowers consists of 12 mixed flowers. The flowers are neatly tied with a matching ribbon. 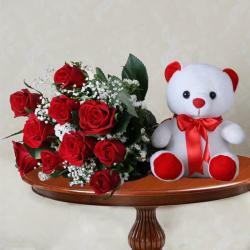 Although considered as old fashioned gift flowers are always able to make a person happy and cheerful. Flowers have the ability of conveying your feelings with different colors. The combo also consists of 1/2 Eggless Dark Round Shape Chocolate Cake. The cake is known for its full flavor. Your occasion is sure to love the delicious cake for the desserts on special occasion. 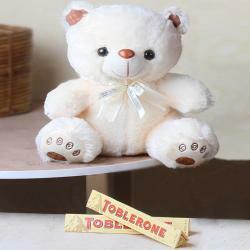 So go ahead and place your order now from Giftacrossindia.com. Gift this hampers to your loved ones and gets appreciated by them and by reviving their mood on special occasions like Birthday, Anniversary, Mothers Day, Best Wishes, Teachers Day, Missing You and many more. Product Includes: Bunch of 12 Mixed flowers Like Roses, Gerberas, Carnation, Gladiolus with lots of filler and Matching Ribbon Bow Tied, Teddy Bear (6 inch) along with 1/2 Eggless Dark Round Shape Chocolate cake.